The medium black heated TOUGHSHELL jacket kit is powered by the M12 REDLITHIUM battery. The heated jacket's carbon fiber heating elements create and distribute heat to the chest, back and front hand pockets. A single touch LED controller heats up the battery heated jacket to three heat settings. The MILWAUKEE heated jacket kit's Quick-Heat funtion heats up three times faster than previous jackets and market competitors. The TOUGHSHELL stretch polyester jacket mateiral delivers five times longer jacket life than previous MILWAUKEE softshell heated jackets. The durable material also provides wind and water resistance to survive the elements whether on the worksite or enjoying the outdoors. This kit comes with one heated jacket, an M12 battery and compact charger and power source. The DEWALT DCHJ060C1 Medium Heated Jacket can provide hours of core body warmth and continuous heat. This jacket features 4 Core heating zones; upper left and right chest, mid-back and collar. The entire line of DEWALT 12-Volt MAX and 20-Volt MAX batteries can be used with this jacket. A DEWALT 1 Year Limited Warranty is included for added peace of mind. Includes DCB201 20-Volt MAX Lithium-Ion Battery (1.5Ah), Fast Charger and DCB091 USB Power Source. DeWalt 20V MAX Heated Jackets deliver style, comfort and warmth to make those cold workdays more bearable. With four core heating zones and adjustable heat settings, users get the ideal level of heat and comfort. Adjustable waist and sleeve cuffs can be sized for ideal heat retention and fitting. Engineered to survive the jobsite and outlast the elements, the Milwaukee GRIDIRON Hooded Traditional Jacket is built for tradesman who can't let cold slow them down. Focused on providing reinforcement in areas where traditional work wear fails, GRIDIRON Ripstop Polyester Outlasts 12 oz. cotton duck by 3x against abrasion and tearing. FREEFLEX Stretch Panels across the back combined with lighter, more durable materials maximize mobility by reducing bulk and eliminating break in time. NO DAYS OFF weather protection provides wind and water resistance and combines with high loft insulation to combat the most extreme weather conditions. Interchangeable Storm Fighter jacket with removable inner jacket that allows you to use both the shell and inner shell with insulated liner during any season. Both Outer and Inner shell are made from 300D Oxford 100% polyester with a polyurethane coating. Both layers include 4 inch two tone tape that meet CSA Z96-09 Class 2, Level 2 requirements and meet Class 3 when worn with the Storm Fighter Hi-Viz Bib Pants. Additional features include mesh lining, multiple pockets, chest pocket, ID window, Kidney warmer back, side zippers for quick access to bib pant pockets, adjustable elastic wrist, heavy duty zippers, and a roll away adjustable hood. Inner jacket also features removable arms and a reversible black shell. 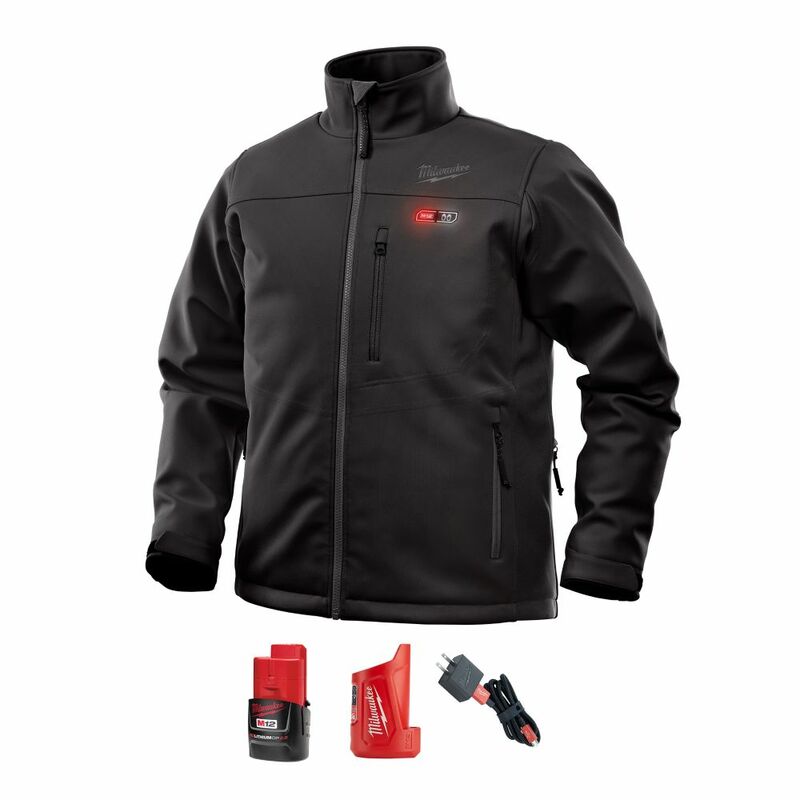 Men's Medium M12 12-Volt Lithium-Ion Cordless Black Heated Jacket Kit w/ (1) 2.0Ah Battery, Charger The medium black heated TOUGHSHELL jacket kit is powered by the M12 REDLITHIUM battery. The heated jacket's carbon fiber heating elements create and distribute heat to the chest, back and front hand pockets. A single touch LED controller heats up the battery heated jacket to three heat settings. The MILWAUKEE heated jacket kit's Quick-Heat funtion heats up three times faster than previous jackets and market competitors. The TOUGHSHELL stretch polyester jacket mateiral delivers five times longer jacket life than previous MILWAUKEE softshell heated jackets. The durable material also provides wind and water resistance to survive the elements whether on the worksite or enjoying the outdoors. This kit comes with one heated jacket, an M12 battery and compact charger and power source. Men's Medium M12 12-Volt Lithium-Ion Cordless Black Heated Jacket Kit w/ (1) 2.0Ah Battery, Charger is rated 4.3 out of 5 by 58. Rated 5 out of 5 by Milwaukee heated jacket from Last year's model I was so glad I could find the very last one in this style as the new quilted style I didn't like. Rated 5 out of 5 by Motomama from Love this jacket I bought this jacket as a gift for my husband. He absolutely loves it. The material is very nice and it looks great. For sizing, it fits a bit big, and as he is normally a large but the medium size is perfect, so make sure you try it on before leaving the store with it. The battery placement isn't the best, but it's typical for most heated jackets to have the battery pack near the back/side of the jacket. (I did a LOT of research on all types of jackets before deciding on this one). Being in and out of the truck all day we were worried that the battery would get 'hung up' or something, but it hasn't, so it's not a big deal. All in all, the different heat settings are great for our weather in Calgary. Make sure when you go through security at the hockey game that you remember the battery pack is in there-it'll set off the alarms! Lol.